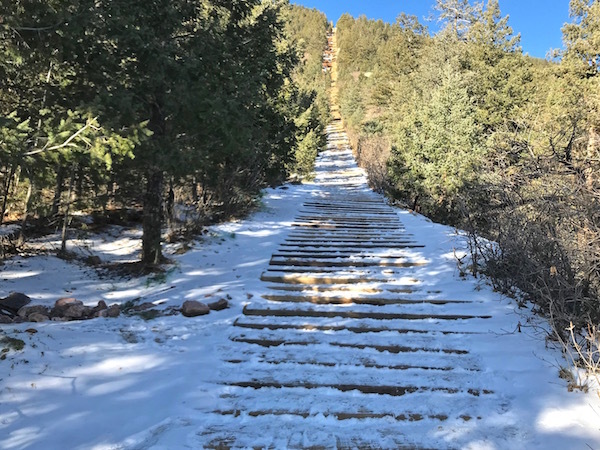 The Manitou Incline Has 2,768 Steps… The Longest Stairway I’ve Ever Climbed! | Keep It Up, David! 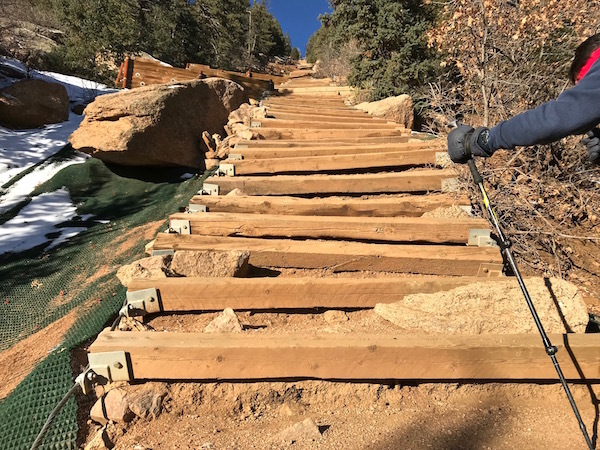 Now check out this feat: I’m at the top of the Manitou Incline, a 2,768-step stairway that goes straight up the side of a mountain in Colorado. It’s the longest flight of stairs I’ve ever climbed – and it’s something I’ve wanted to do for years. 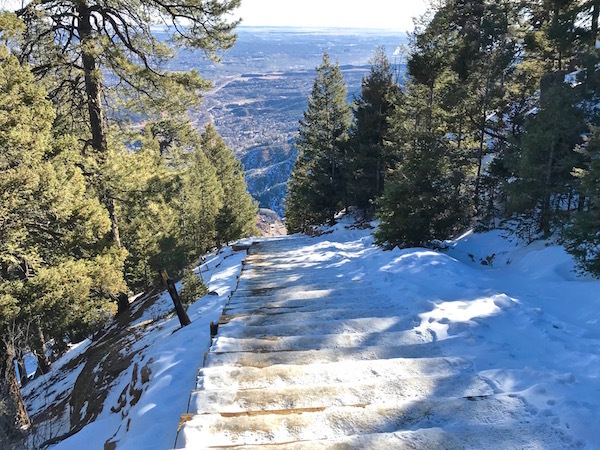 The Manitou Incline is an immensely popular hiking trail in Manitou Springs, just outside Colorado Springs. The path, which slices through the forest like a scar, rises over 2,000 feet (from 6,500ft above sea level to 8,590ft) in under 9/10ths of a mile. When we arrived, the highly visible moon was perched just above the top. I used the word “we” because I met my friend Steve there. 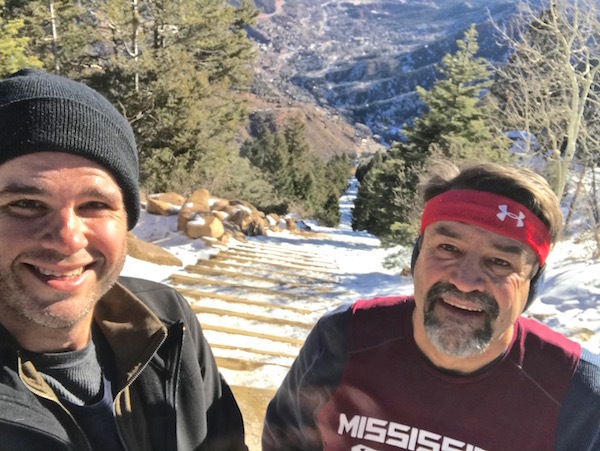 Steve is a local, who I met through the stair racing circuit, who climbs the incline just about every single day, all year long. In a good year, he’ll climb it over 500 times! 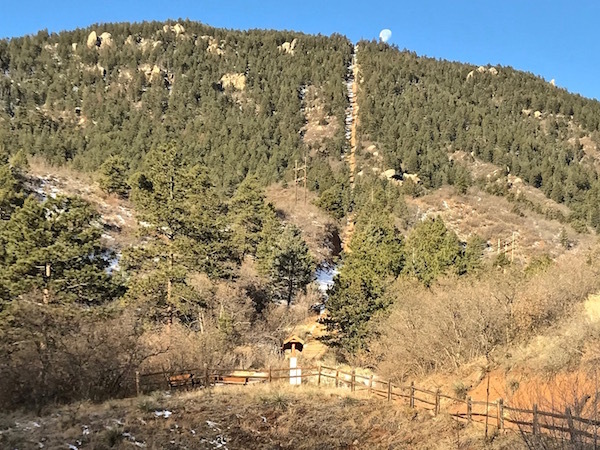 The incline dates back to 1907, when a funicular was built so water storage tanks at the top of the mountain could be accessed, serviced, and repaired. 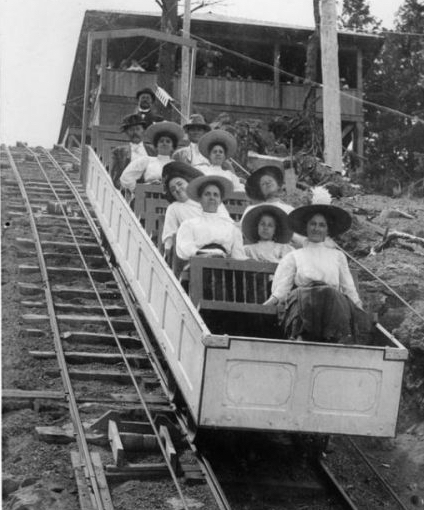 Soon it was open to the public as a tourist attraction, until a rock slide did irreparable damage in 1990 and the funicular was removed. But the funicular’s railroad ties remained behind, and hikers began using them as stairs to climb to the top. There are 2,768 ties/stairs, and a vast majority of those are in a single, uninterrupted flight. The Sears Tower race in Chicago, which I’ve done twice, has only 2,115 steps – so this has over 600 more steps than the tallest stairwell in the western hemisphere. 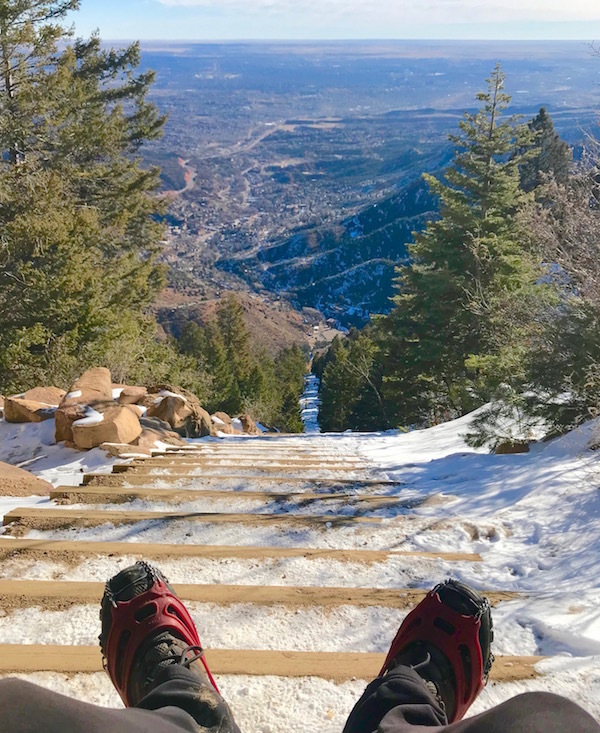 I’ve wanted to climb the Incline for a few years, mostly thanks to Steve’s Facebook feed, which is very inspirational and features gorgeous photos. And even though I have family in Colorado and visit once or twice a year, it’s almost two hours away from my sister’s place – not exactly down the road. But I had my car on this visit, so I decided to do it on my last day, before driving back to California. 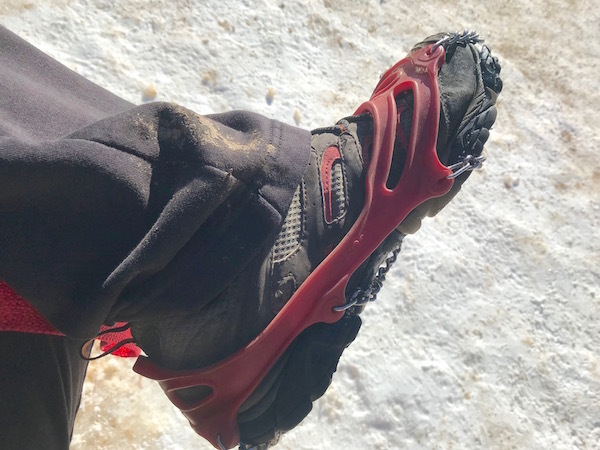 The snow and ice were no problem, because Steve lent me a pair of chains that I could pull right over my hiking shoes. These are awesome! 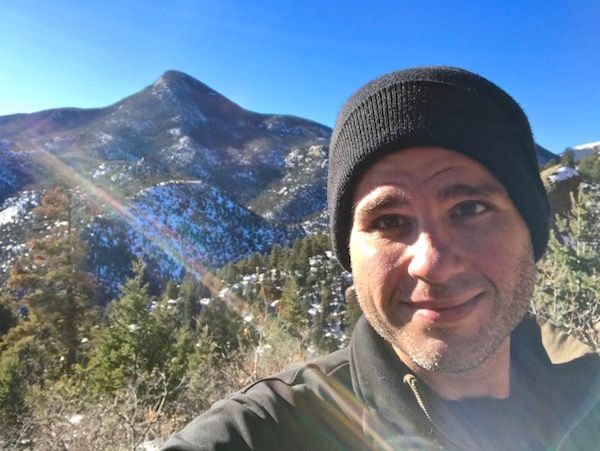 While it was chilly, the sun was also out, and it felt great on my back as we climbed. The climb was H – A – R – D. I was huffing and puffing within minutes. 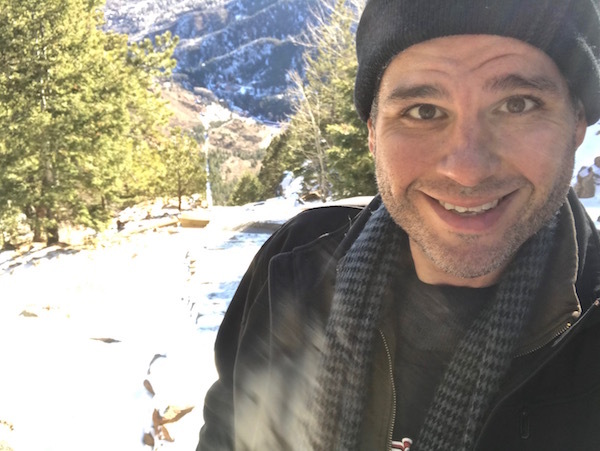 It was cold, challenging, and I wasn’t used to the elevation. While quitting wasn’t an option, we did take breaks – a couple on our own, and a couple because we passed friends of Steve’s that were on their way down. Steve knows everyone on the mountain! Oh, and get this: this climb has a false summit. You climb for an eternity, always looking up and seeing what you think is the top, but it’s not the top! It’s just a slightly flatter section, and there are 600 more steps beyond that before you actually finish! JJ came with us, and he was a trooper, occasionally looking back with a ‘what’s taking you so long’ look. I didn’t see the sign at the bottom that said ‘no dogs allowed’ until afterward – oops! 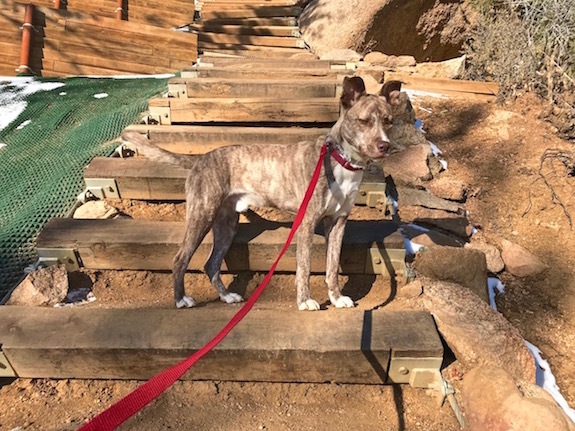 But he was a very good boy, and happily greeted the handful of others that we met along the way, and I removed his poop from the side of the stairs after he finished doing his very important business. By the time we got to the top, I was breathing so heavy that I could barely talk. Steve sprinted the final 50 steps or so, and I tried, but I simply couldn’t. I loved seeing how the trail seemed to drop off, from the summit, like a cliff, and then see it way down below in the distance. Speaking of Steve, there’s the Incline master himself! We didn’t take the stairs back down. There’s a trail, called the Barr Trail, that goes up the mountain alongside the stairs, switching back and forth dozens of times, so we took that down. The Barr Trail is gorgeous, too, winding it’s way through the forest, offering views of the neighboring peaks. JJ’s favorite part of the outing was on the trail, when we spotted a couple deer. He got into the doggie play pose and started whining and trying to crawl through a fence to get at them, but I wouldn’t let him. It took Steve and I about 74 minutes to climb the stairs. Including the trail back down, we hiked for a little over 2.5 hours, and covered 3.8 miles. My app said I burned 1,349 calories! This entry was posted on Sunday, December 2nd, 2018 at 5:33 pm and is filed under Uncategorized. You can follow any responses to this entry through the RSS 2.0 feed. You can leave a response, or trackback from your own site. 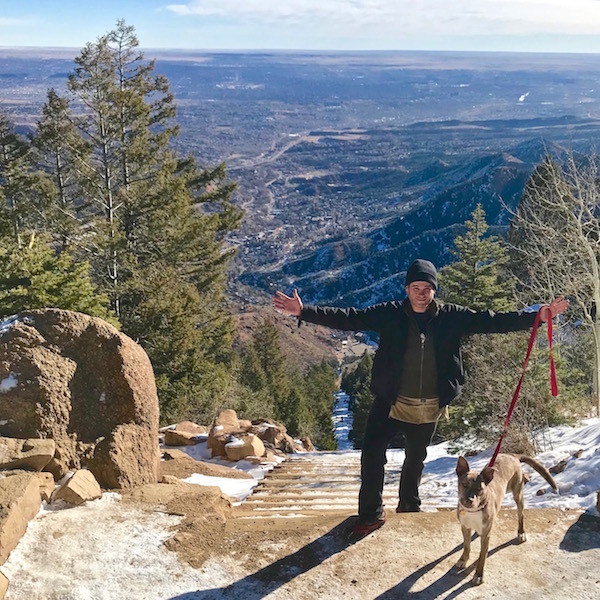 4 Responses to The Manitou Incline Has 2,768 Steps… The Longest Stairway I’ve Ever Climbed! This is awesome! What a great outing and blog! I absolutely MUST do these next time I’m in Colorado. Way to go! I lived in the Springs for 10 years and never attempted it. My knees and lack of athletic ability to tolerate it kept me from going. But I heard all the time from others how amazing but intense it was. I now live in SW Colorado and love it so much….less traffic and even more beautiful!